This broadleaf evergreen plant native to China, Japan, and Korea, is a tough adaptable medium-sized shrub that can be used in a variety of ways in mild climates. 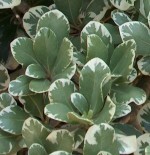 Upright with a round form and coarse texture, pittosporum has outstanding foliage. 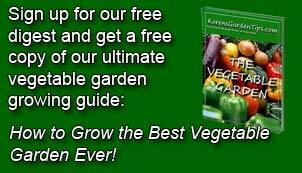 The oval dark green leaves are one to five inches long, leathery and shiny, and are produced in whorls around the stem giving the plant an overall dense and bushy look. In spring two to three inch clusters of fragrant white flowers are produced followed by a hairy, woody capsule containing black seeds. 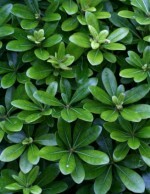 Plants can take shearing and heavy pruning so pittosproum is good for formal hedges and screens. It does well in both sun and shade and is attractive in borders and containers. Because of its salt and drought tolerance it can be used in seaside plantings. The foliage is popular in the florist trade. 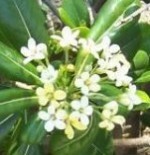 Bloom: Small fragrant white flowers are produced in clusters 2-3′ cross in spring.